I begin my words in the name of Allah, the merciful, the compassionate, and from Him do we seek help, All praise be to Allah, the Sustainer of All the Worlds, and blessings and peace be upon our master Muhammed (salla Allah u alihi wa salam) ,and on all his Family and Companions. I thank to Allah the almighty as the people are here in the dervish lodge of Sheikh nibs and they are faithful to their belief.While giving thanks to Allah the almighty again and again, I pray from him that he renders this apperant view to an Islamic view .Allah the almighty grants us (to the muslims) some people who will keep his accepted behaivors far from the political thoughts and keep them safe. 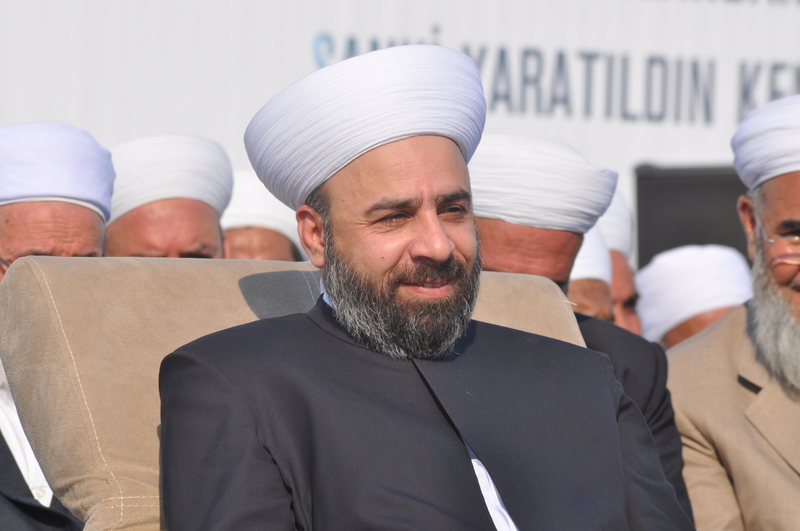 I heard some words from My Father Sheikh nibs (hadrat): He said: it is very hard and arduous work to fulfill the necessities of The Nakşibendi Haznevi orders and to walk on this path. Because, when one fulfills the orders of Naksibendi, he will get many great mitzvahs in return to this. Dear brothers,This behaviors has such great mitzvahs (goog deeds) that it is very difficult for the fleshy body (nafs al-ammara)) of a person to fulfill these orders. So the flesy crawings don?t want to obey these orders. Sheikh (hadrats) told more about it : There are two ways for the human being to choose; He will either yield to his fleshy desires and thus, he can’t get the the favors and benefits of Allah the almighty, or he will overcome his fleshy crawings and be patient of these difficulties, and get higher spiritual ranks by acting according to these orders. A follower of a dervish order should have his own way of self-assesment. If it is very difficult for him to have accepted behaviors, to worship, to fulfill the principles of the Order and to read the Holy Quran, and If he likes illegitimate actings and fleshy desires, he should realize that he is still a beginner. Dear brothers, whoever overcomes his fleshy desires and discipline himself will be successful on fulfilling the Islamic orders easily.His spiritual manner gets nicer. He gets spiritual peace as his flesh doesn’t anymore desire to do harm to him. Dear brothers, it’s understood that a person who is dependent on his fleshy desires has no courage. He has no control of himself. So his flesh became superior to him and it controlled his desires. My father, Sheikh nibs said that : There are such people that they sacrificed their spirits on this way and acquired those high positions. We feel regret when one leaves the way of salvation and feldh for small and worthless thing. Dear brothers, we do not consider the order’s procedure important. we don’t consider (dhikr , khatma) recitings important. While we are in this situation, How we will get to the ranks idenditified for us, how we will progress on this way. Dear brothers, even if very small, a mundane work or benefit isn’t postponed or cancelled. But, as for the reciting Allah the almighty regularly (daily), one may think that it doesn’t need to be done in an instant or he may say to himself that I can do half of it and half of it is left incomplete. Dear brothers, if we had thought that negligence of these behavior was harmfull to us and if we had understood that such actings weren’t any useful for us, we wouldn’t act in this way. we pay attention to a wealthy person and show him high estimation for his wealth as we may benefit from him.However, we forget that these princples of the order are the best benefits for us. Dear brothers, we should put our life and affairs in order, whe should consider and act according to the accepted behaivors.We should consider our limitations. We should observe ourselves whether we can live according to the principles of the order and act according to the orders of islam.We need this to make our remaining life nicer and utilize the little time we have till the end of our life. Dear brothers, undoubtedly, following the path of the order’s saints and the accepted behaivors which they developed means following the Sunnas and morals of Our Master Prophet Muhammed(salla Allah u alihi wa salam. And following the path of Our Master Prophet Muhammed means following the path of Allah the almighty. Undoubtedly, it isn’t possible for us to grasp the high spiritual positions of saints of our order, their effort and the significance of this issue thoroughly. I pray Allah the almighty that He bestows us common sense to follow their path and to carry out the accepted behaviors of them. Allah the almighty has the power over all things.